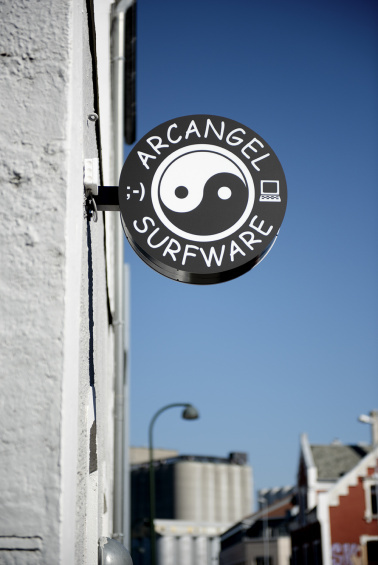 Founded in 2014 by Cory Arcangel, Arcangel Surfware is a “multinational software & merchandise publisher” based in Brooklyn, NY, and Stavanger, Norway. Existing in parallel with Arcangel’s artistic practice, the brand––which produces wearables and publishes texts, software, and artists’ projects––posits retail as an alternative way to circulate art and engage with audiences. Previously based online, Arcangel Surfware is now only available IRL—at pop-up events and at its brick-and-mortar flagship in Stavanger, Norway, which opened in 2018. For this one-day event, presented as part of the exhibition “The Art Happens Here: Net Art’s Archival Poetics,” a bespoke retail environment will feature recent and classic products from Arcangel Surfware. At 3 pm, Arcangel will join Ed Halter, critic, curator, and recipient of the Thoma Foundation’s 2017 Arts Writing Award in Digital Art, for a conversation presented by Electronic Arts Intermix. The conversation will also accompany the live uploading of a TXT file containing a new essay on Arcangel’s work, produced with the support of the Thoma Foundation. This program is free with paid Museum admission. Seating for the 3:00 pm talk is available on a first-come, first-served basis, as capacity allows.